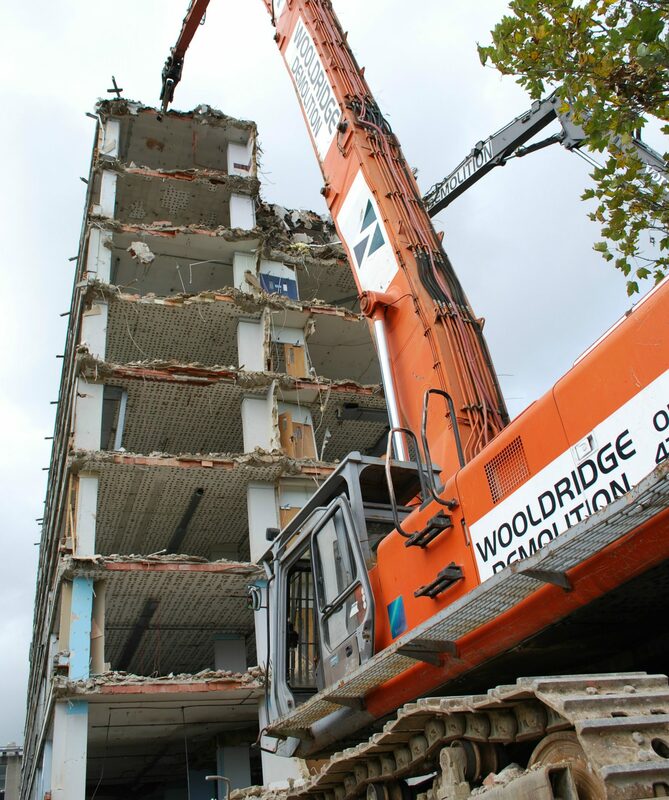 The careful removal of the central atrium and floors of a fivestorey building while leaving the façade in place, posed a different set of challenges for the Wooldridge Demolition team. Working space was almost non-existent, and material removal had to be by tower crane and into waiting trucks. In addition, the property undergoing renovation was adjacent to the Royal Courts of Justice, in Essex Street, The Strand, compounding the issues associated with noise management, vibration control, dust suppression and logistics. Our solution was innovative: run a process of top-down demolition using super-silenced mini excavators and hydraulic attachments, avoiding the use of percussive and impact equipment. Our largest machine on this project was just 2.5 tonnes in weight. The intricate nature of the process was one that required a lot of additional temporary works, including back-propping walls and floors, and the construction of foundation pads to allow the tower crane to be located within the heart of the building. access holes on floors and walls, so that heavily silenced work could progress. so quiet and so stealthy, that we were allowed to work all day, completing the strip-out of the five-storey property within 14 weeks.